When wandering around the dollar store, I always check out the toy section. Most of the time it's just knock-offs and toy guns but this time I got lucky and found a row of "Star Trek." Being the nerd I am, I had to take a closer look. Officially licensed. Hasbro. Star Trek. I can definitely shell out the $1.50 to see what's inside these blind bag. I grabbed two (because I have no willpower) from the rack and headed to the cashier to pay for my not-quite-Lego. The first thing to surprise me was the list of possible figures. 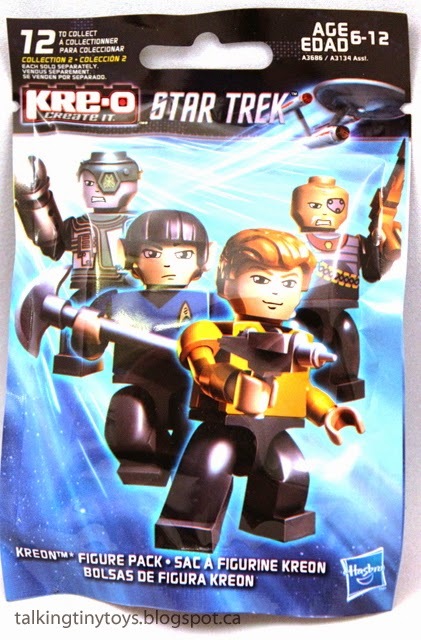 I expected the blind bags to be a promo product for the JJ Abrams Star Trek films, but no. 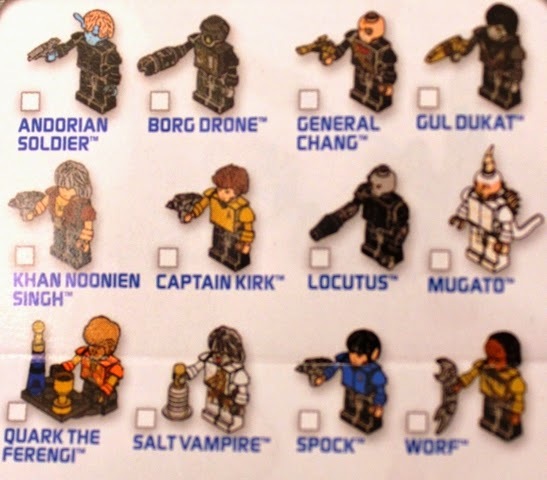 Instead, these blind bags range from Captain Kirk (TOS) to Locutus (TNG) and Dukat (DS9). A weird mix of characters to be sure, but fun for any Trekkie (I'm taking it back). With the slight hope of getting Worf (and his Bat'leth!) I opened the first blind bag. No such luck. Instead I found Quark the Ferengi. 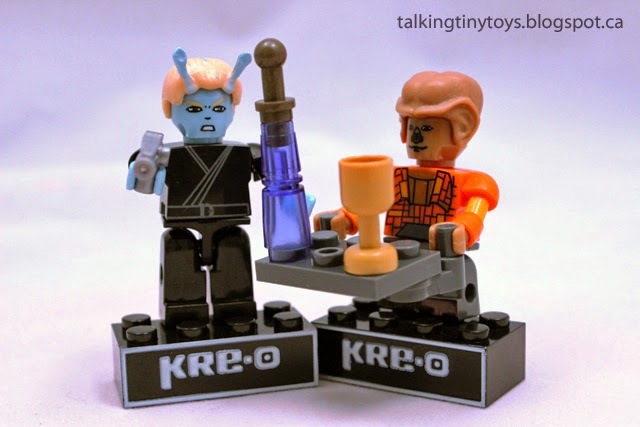 Admittedly, I'm not a huge DS9 fan, but Quark came with a lot of pieces and I'm sucker for props. 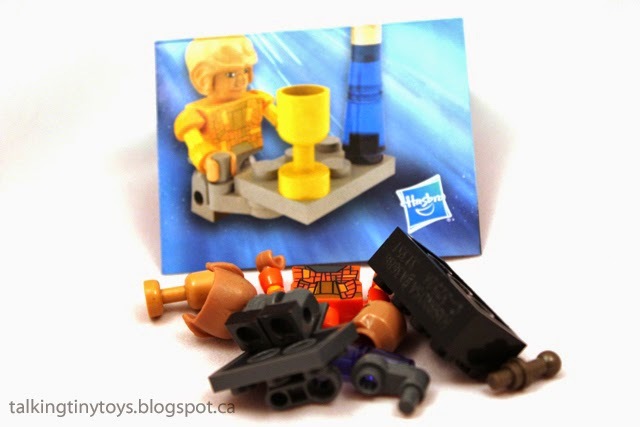 Each figure comes with a checklist, and building instructions. KRE-O are put together basically the same as Lego. Their proportions are a little different (arms longer, legs shorter, heads are less round) but they're about the same size. 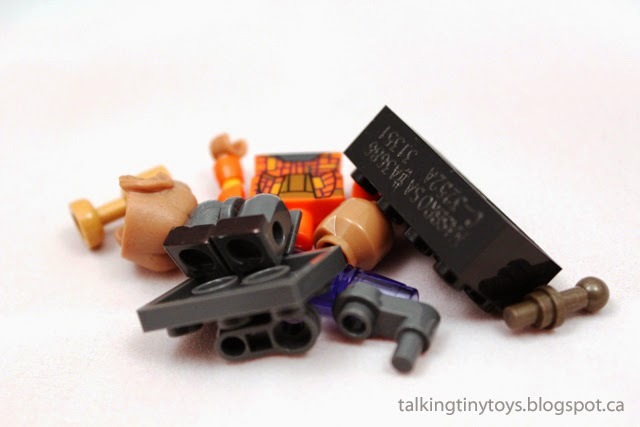 The blocks and accessories can actually be interchanged (another surprise). So, how does Quark look? 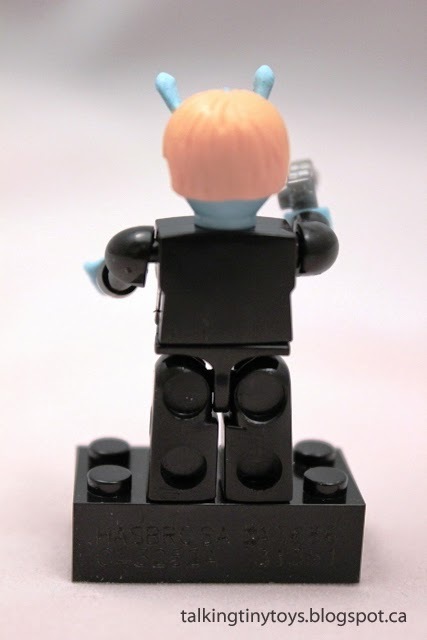 Like all stock part mini-figures, their can be a little weirdness when the character doesn't fit to the original mold. 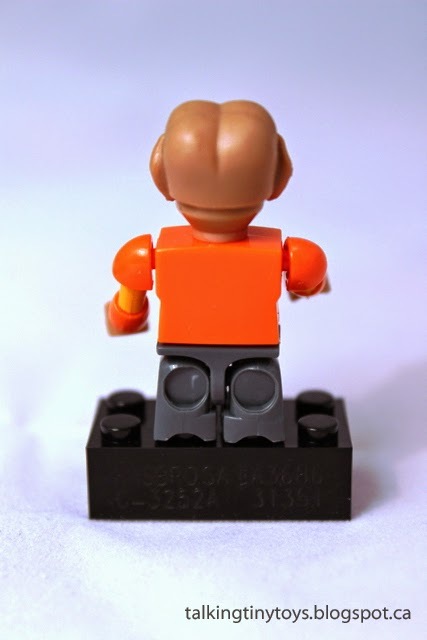 The Ferengi head is an important part of character identification, so an extra piece was created. It snaps into the head (like a hat) which creates a weird distinction between face and forehead. The nose ridges are a little strange and really make me want to find the Worf figure for comparison. 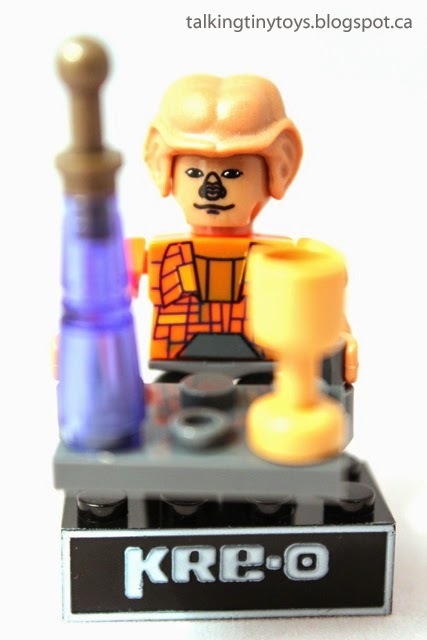 Still, I'm impressed by the amount of detail they put into the head and ears. 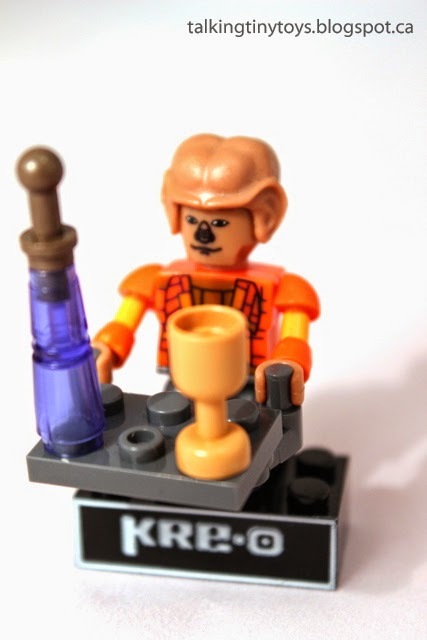 He might look like a but-head, but that's kind of Quark's deal, isn't it? The second bag was just as fun as the first. 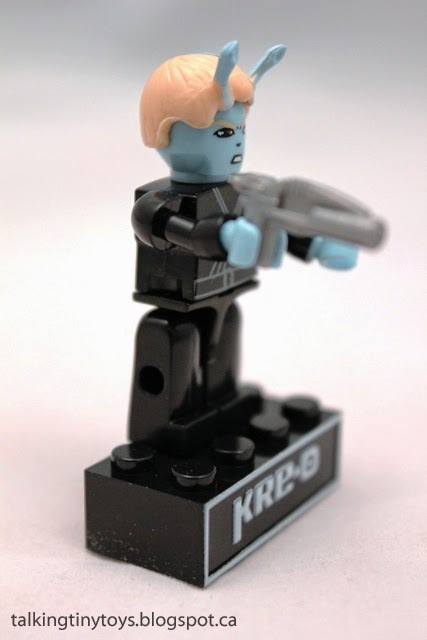 I should probably do a post on the number of blue action figures I have stashed around my apartment. 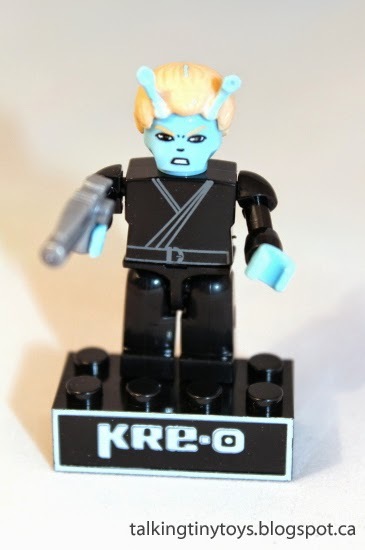 This Andorian soldier can be added to the list. His outfit is basic black with a few line detail. His hair is nicely mold and I can forgive the flecks of blue paint because of the price. The gun has quite a lot of detail for a toy of this scale. 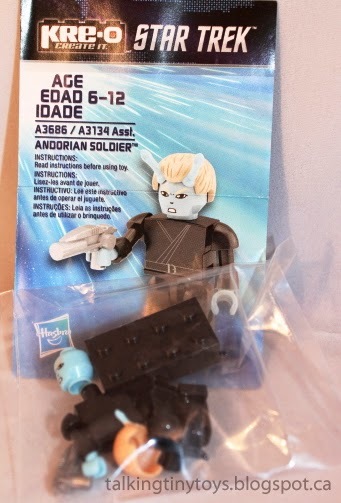 Their faces are expressive, they're well made, and the blind bags have a great variety of characters. It's going to be hard not to pick up another one the next time I'm browsing the shelves. Take a look yourself. They were well worth the $3.00.